So, show of hands....how many of you watched "The Minimalists" doc on Netflix recently? OMG...how did you feel afterwards? I felt gross to tell you the truth. We just have too much stuff! I felt gluttonous thinking of all of the clothes in my closet that I don't wear & all of the random beauty products in my bathroom, I felt bad that my kids have so much stuff they just don't need, I felt stupid for blowing so much of our money on just STUFF. You know the saying, right? 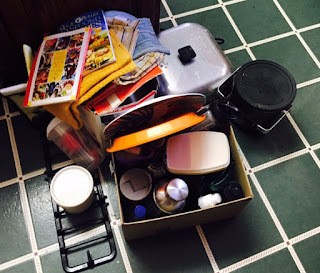 "You can't take it with you when you're gone,"
"The Life-Changing Habit of Tidying Up." Lol, ironic isn't it? So...since the New Year, I've been working to declutter my home (I'm by no means, a hoarder) but I had stuff that needed to be gone ASAP. Let me tell you, the more rooms I have cleared out, the more clear my mind has become. I decided to start with baby steps. 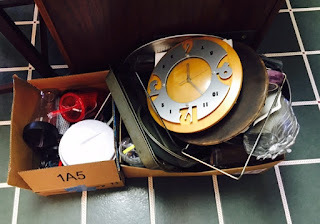 Each weekend, I've chosen one room to clean out (I've done the kitchen, our coat closet under the stairs, my bathroom, and a little in our attic and garage). I had stuff in some places from when we were married and stuff that just was moved here 5 years ago when we moved into our current home. Goodwill has seen me SO MUCH o f me in January and I'm not even close to being done! I was so inspired by this doc that I decided to listen to their book over the next week, entitled, "Minimalism: Live a Meaningful Life." Blew. my. mind. The authors talk about the 5 principles of Minimalism and I found it so interesting how it applied in what's going on in my life right now. 1.) Health: This was #1 because, well, if you don't have your health then you can't enjoy your life and all of your things! The authors talked a lot about keeping a simple diet (what they described sounded very similar to my precious Whole30). Keeping away from processed foods, sticking to real foods, etc. 2.) Relationships: This might be a touchy subject for some, but I'm just going to put it out there. They talk a lot about having people around you that add value to your life and avoiding those that don't. I am 35 years old, and I would say most other women my age would say that the relationships in their lives have changed over the past 10 years (especially for moms). Jobs, kids, interests change and so do friendships--and you know, what? That's ok! I'll admit it, I've been dumped by friends, I've not been invited to stuff, etc. I have had to learn to not take it personal and seek out friendships where I can add value to their lives and they can add value to mine. Now, there is the matter of being around people that you can't totally eliminate like family or colleagues/bosses...in my opinion, it's all in your mindset of dealing with these people. I would try to add value to their lives (even if they aren't adding value to yours). 3.) Passion: What are you passionate about? If you could do one thing for the rest of your life, what would it be? (Easier said than done, I know!) This doesn't even have to mean in relation to your job---maybe you absolutely love DIY projects, scrapbooking, fitness, etc. If you know me, then you know I am extremely passionate about the work I do with the American Heart Association, but as my interests have changed over the past couple of years--I have become very passionate about my own health and sharing how I can manage to make it work for me with other busy working moms. Even if you're stuck in a 9-5 that is just there to pay the bills, I would strongly encourage you to figure out what you're passionate about and how you can incorporate that into your day in order to make you feel fulfilled. And mama's--I know you're going to say you're passionate about your kids (duh, me too!) But what else are you passionate about that is just for you? 4.) Growth: This can be looked at in a couple of different ways. Personal Growth: what are you doing to enhance your mindset, ways to help you be a better wife, mom, colleague, etc. This past year, I have really focused on my own personal development through reading books on leadership, having a positive mindset and just being a strong woman. I can't begin to tell you how much this has helped me. The other way to look at growth is Financial Growth: you can't save money if you're spending it on stuff all the time. We have a savings account, we give to our church, we're doing alright but we want to do more to secure our future and our boys' futures (we also want to remodel our house!) Since the beginning of January, I have become super intentional with what I spend, asking myself why I want this and if I really need it. Also, anytime I do buy something I'm letting my husband know (regardless if it's groceries, gas, or stuff the boys need). Dustin (my hubby) is the most responsible person ever with money--I think he's saved his Christmas money from the past 3 years from his grandparents. He's not saving up for anything in particular, but just saving for when he does come across something he'd like to have. (Not me...that money was long gone by the next day!) I could tell my boys were taking after me whenever they were given money and we're trying to show them how saving and giving is worth far more than anything you could buy. I'm so happy I stumbled upon this documentary and listened to their book. AND....I just found out there is a Minimalist Podcast! Yes!!!!!!!!!!!! For this road warrior, anything I can listen to in my car while traveling for work is the best ever! So, let me ask you this....what can you do to minimalize your life? Your health, the people in your life, unnecessary clutter, etc. I'm working on it step by step. You can do it too!